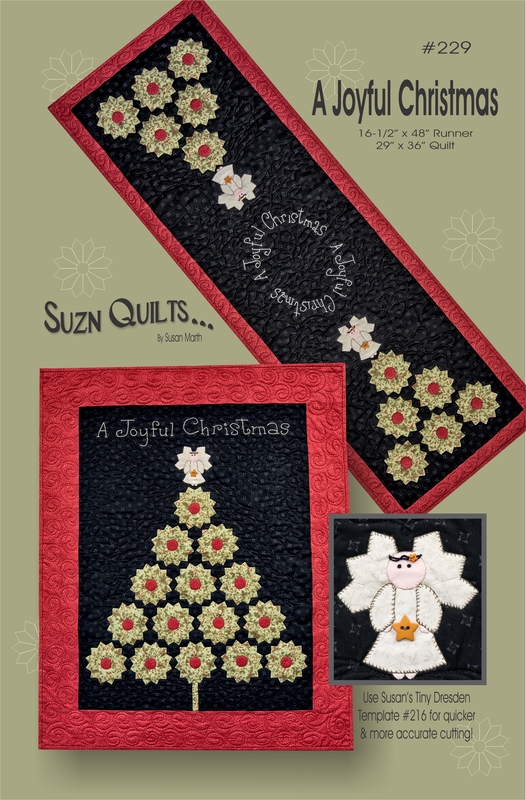 New Christmas Quilt Patterns | Quilting my way through life! 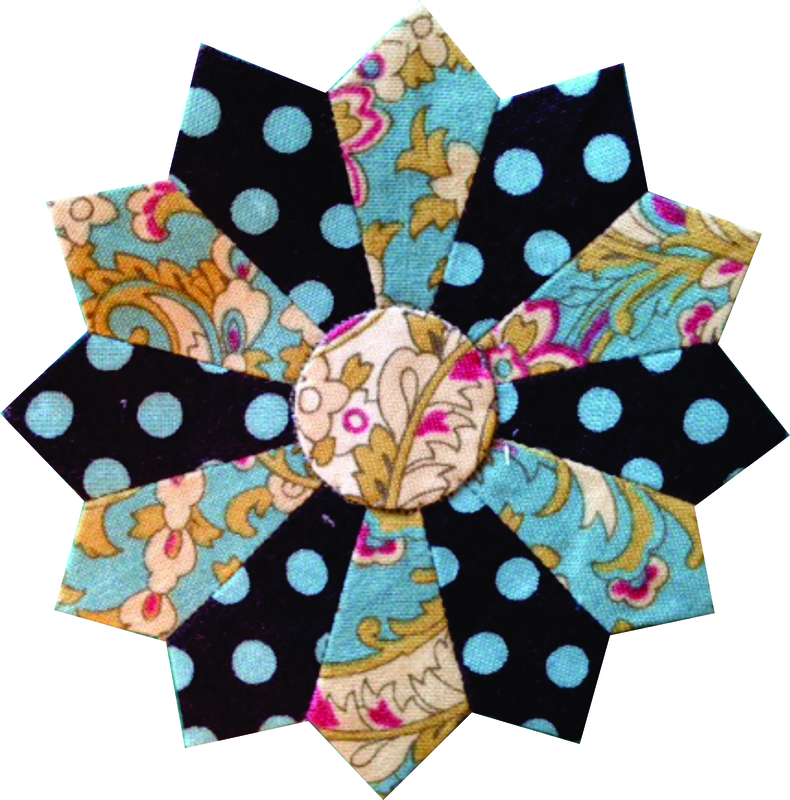 I have 6 new patterns for you! 3 of my new patterns are table runner/placemat patterns. You cut your backing & batting to the finished size of the quilt. You baste the two together. I prefer basting spray, but pins will work too. Following my instructions, you use this as a “foundation” to sew all of the strips onto. Once all of the strips are sewn onto the foundation you might have a bit of fusible applique to add (depending on which pattern you choose). Bind the quilt & it’s finished! or perhaps a wedding or anniversary gift. or your friend’s table for all of the patriotic holidays. but it also incorporates my Tiny Dresden plates! applique them onto a strip then add the strip to the foundation. It will also look great on your table for our patriotic holidays. just for me, but I hope you enjoy it too. Use an ENTIRE jelly roll to quickly make this lap quilt. the foundation you can make this entire quilt in just a day! You’re going to want to make lots of these for gifts. They’re the perfect size for kids to cuddle up in while watching TV or lap quilts for friends. is a cutie that uses my Tiny Dresden plates. This quilt will look cute in non-Christmas colors too. with a bible verse reminding me not to be so stressed out! & a bit of perle cotton embroidery make this cutie. I’m putting them on my website today. Snow is on its way here. I plan to get some sewing time in. They’re back from the printer & ready to ship! 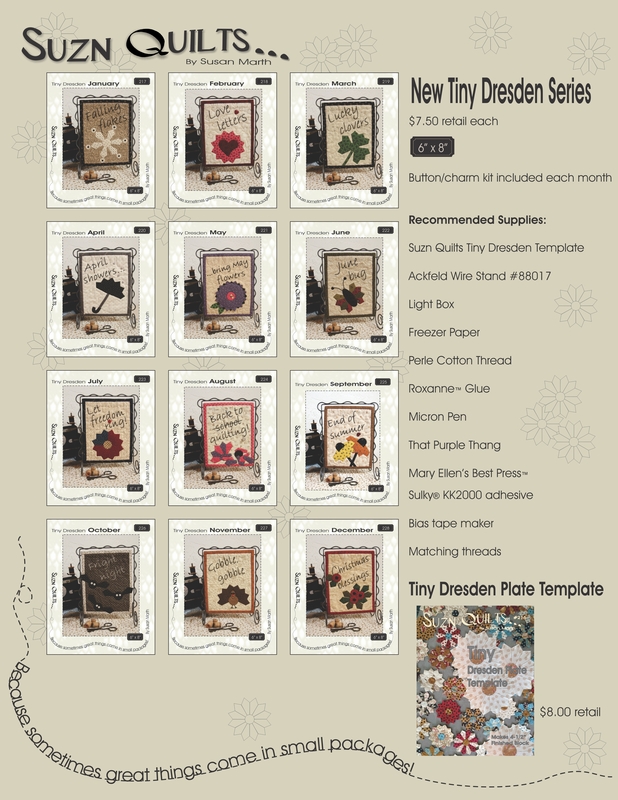 New patterns that use my new Tiny Dresden template. These are quick & easy. Completely by machine except for the hand work to stitch the binding. make either the runner or wall quilt with adorable little angels. the rest was all done by machine. I even sew my buttons on by machine. I can’t wait to see what other color combinations these are made into. I used fat quarters, but you can use charm squares & layer cakes along with yardage. A shop ordered these yesterday and she’s going to use the new Downton Abbey collection. 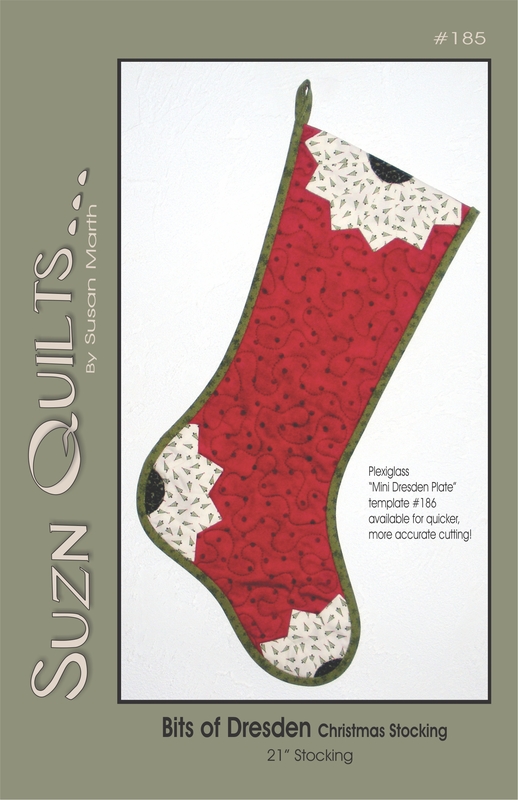 Check your local quilt shop or my website to get yours today. Sew them for Christmas, or put them on your Christmas list! and they’re available for pre-order on my website. you can see these quilts. It’s a lot of work getting designs into pattern form. I’m fortunate though that I can work around my family life. I wear so many hats! & a 29″ x 36″ wall quilt. an angel or two, who’s wings are also Dresden petals! I know, I’m so clever… just a piddler really. Give me some fabric & my brain starts dreaming. my brain was getting even more ideas for quilts. but you don’t sew a whole plate. & put them in various places on a smallish 10″ Christmas stocking. that uses my Mini Dresden Plate Template. This stocking is a generous 21″ tall. but I have a habit of my favorite quilt being the one I just completed. with the help of my new sewing mate. my Mini Dresden Plate Template. & my photographer did a great job of capturing its good side. I could see myself making another one of these! Don’t dare count those TD’s. I hope you’re in love too. if you can’t find them at your local quilt shop. I’m so thankful that even though Chloe has graduated & has a big girl (non-quilt related) job that she still wants to take time off & help me at market. 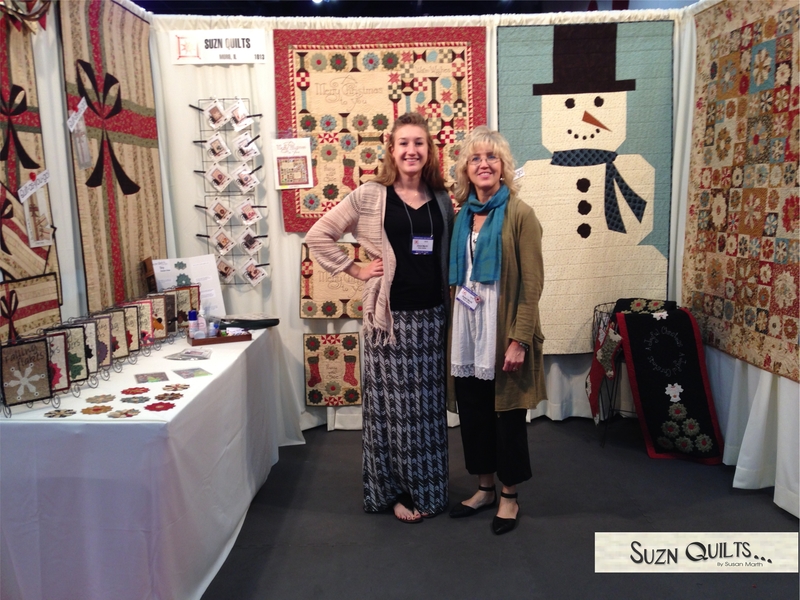 I say help, but once I explain my new designs she can sell Suzn Quilts as well as I can. 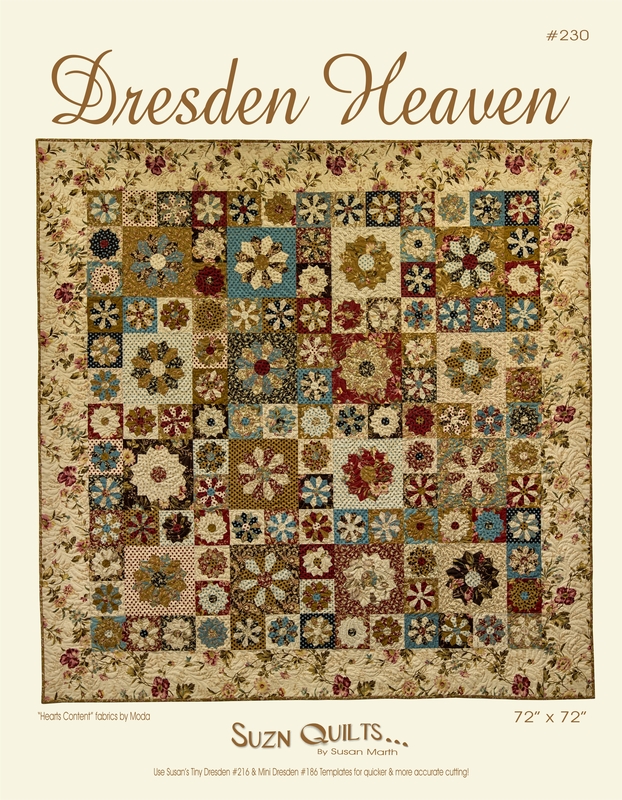 We had lots of interest in my new Tiny Dresden Series. 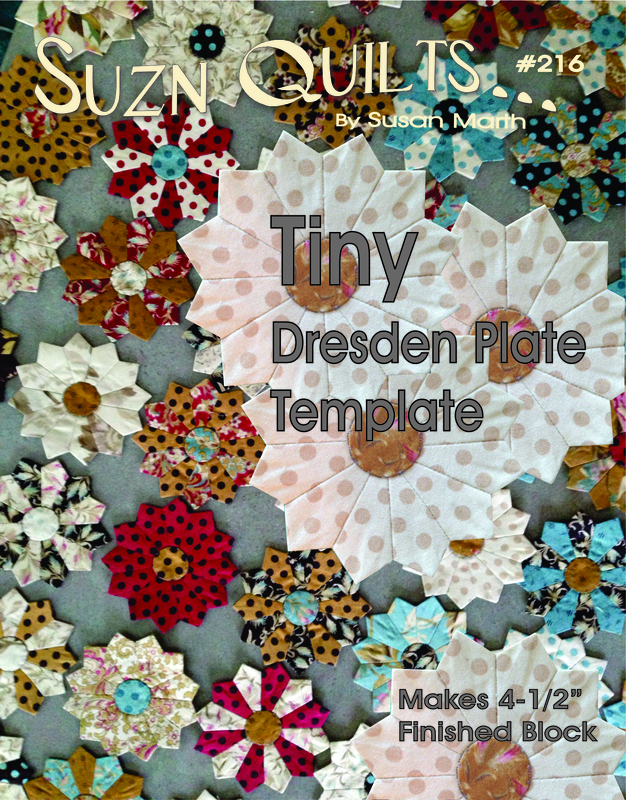 I LOVE to make these Tiny Dresden Plates! They’re a bit addictive, so beware!!! No hand work unless you want to make them by hand. My quilt-as-you-go patterns sold very well also. 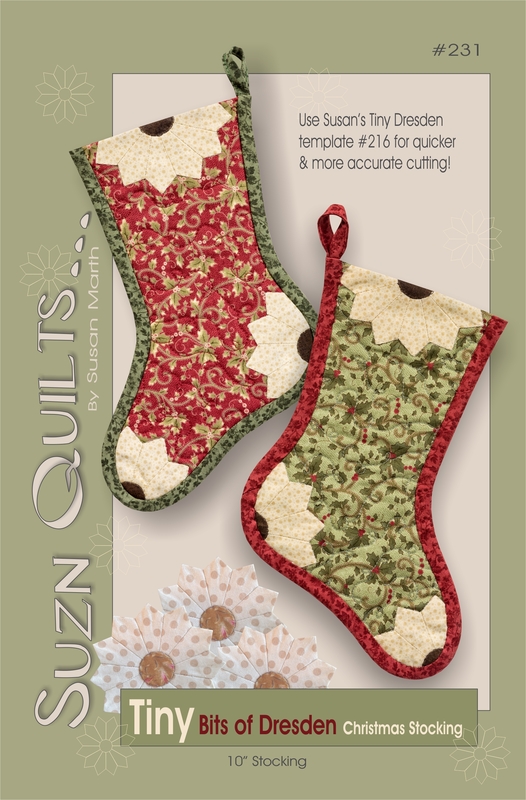 but many quilters are making them in batiks & other non-Christmas colors. mystery or stand alone pattern, it sold well too. Notice those cute tiny Dresden Plates in that pattern too? but I still need to get the photography done on them. You can see them in the above booth photo by “Frosty” if you look closely. I’ll show you them as soon as they’re ready. I hope you’re getting some quilting time in too. 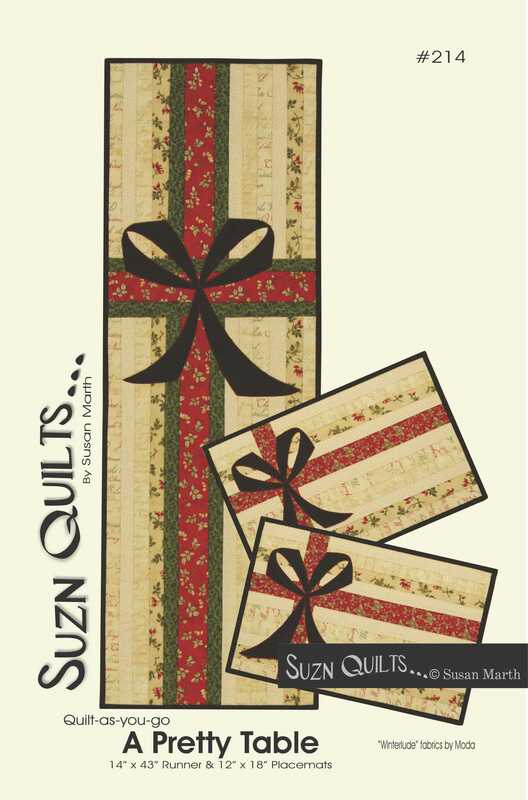 I’m excited to next show you a new addition to my Quilt-as-you-go patterns. I’ve had many inquiries asking to have a table runner adaptation. Not only did I do this, but I also designed place mats to coordinate. 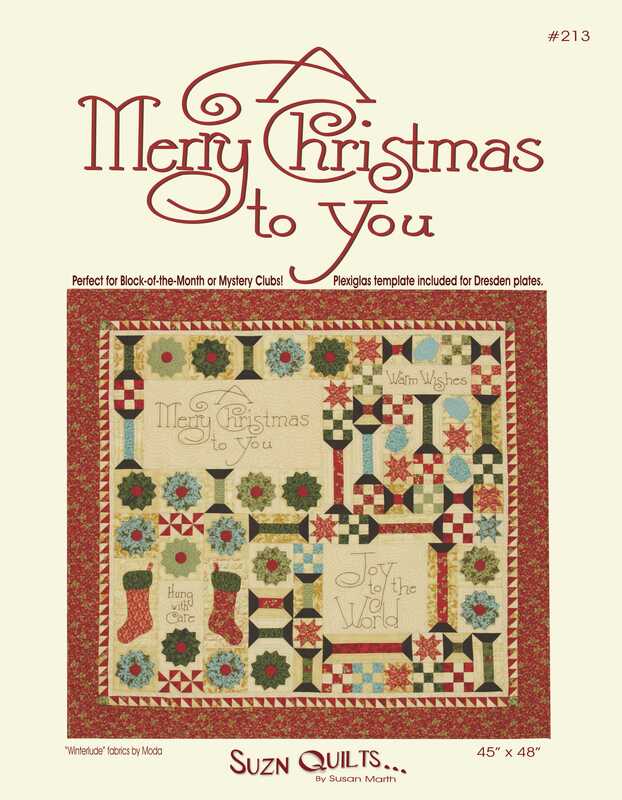 and I’ve also received lots of emails from quilters that made it for other occasions too. It’s now available on my website. Remember, I’ve been giving you little snippets of them here & there? They are part of my new Christmas sampler. It’s written in a way that will make it a perfect Block-of-the-month or mystery club quilt. 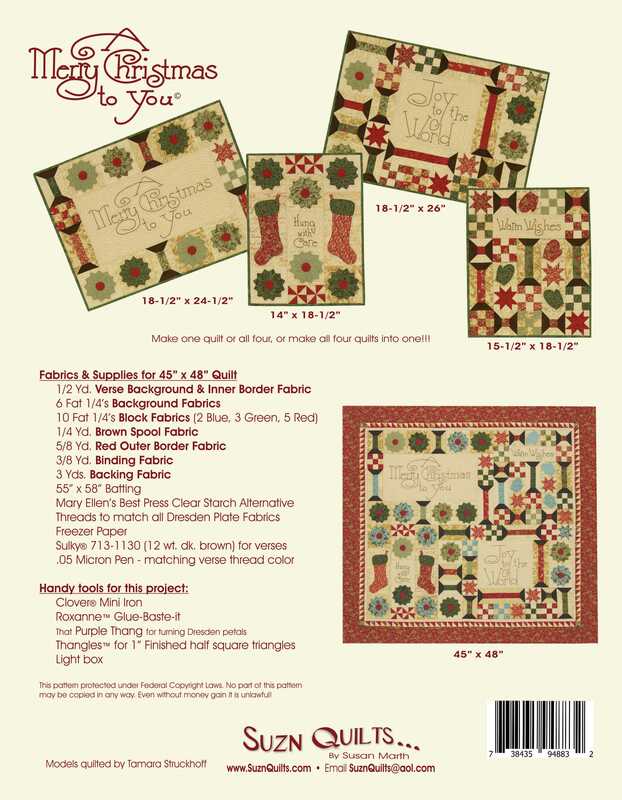 You can make four gifts, or display the smaller quilts around your home. The pattern is available for $28.00 & includes the Plexiglas template! 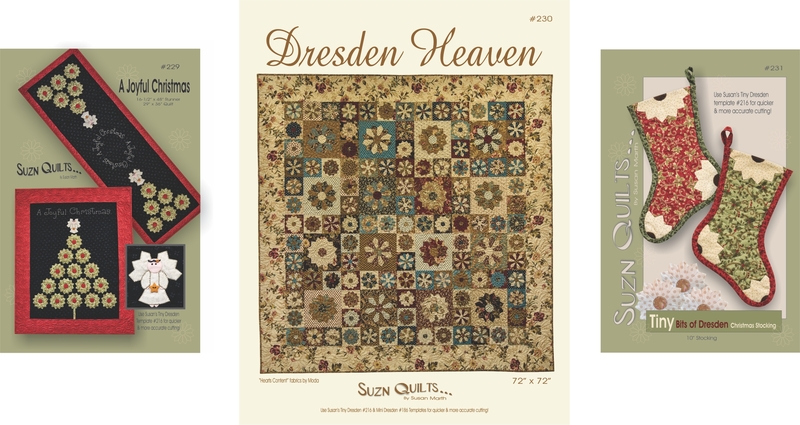 The Tiny Dresden Plate blocks measure 4-1/2″ finished. The template is also available separately for $8.00. It’s available on my website. Stay tuned for more new patterns! It’s another of my Quilt-as-you-go lap quilts. What a fun way to wrap you or a loved in on a snowy winter day! My quilt-as-you-go lap quilts are very popular. You can view a tutorial here. Once you make one, you’ll want to make more! Frosty starts with cutting some strips. Some of the strips have corner cut-off sewing. there is a bit of fusible web applique. 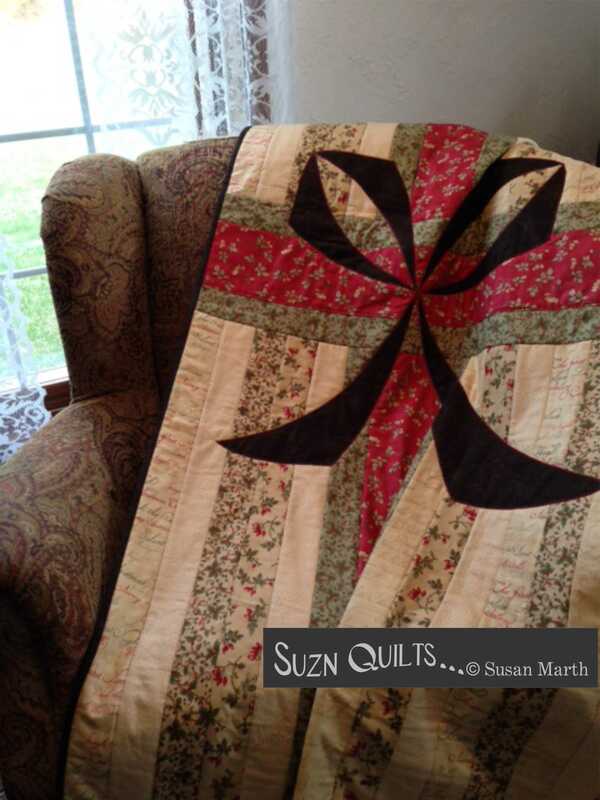 Sew on the binding and your lap quilt is complete! but it will also look good hanging on your wall all winter long.